Kids Can Press, 9781554533022, 32pp. It's a band of animated skeletons versus daring children in this rhyming Halloween picture book tale, told in delightful nonsense language. Here the children are ?tyke-tots? and the adults ?tall-bigs,? while the skeletons are called ?SKUL-A-MUG-MUGS.? As the story begins, the SKUL-A-MUG-MUGS descend on a small, quiet town on Halloween night. The SKUL-A-MUG-MUGS have a plan to keep the children from trick-or-treating. But the children decide to take matters into their own hands. What ensues is a fun, spirited fight to the finish, as naturally the children outwit and out-frighten the old SKUL-A-MUG-MUGS so the trick-or-treating can commence once again! In this one-of-a-kind book, award-winning author and children's poet Robert Heidbreder has imagined an empowering story about a chaotic world where the adults are terrified and the children take over to save the day --- and the candy, of course. The silly and spooky madness is delightfully illustrated with irresistible artwork by award-winning John Martz. 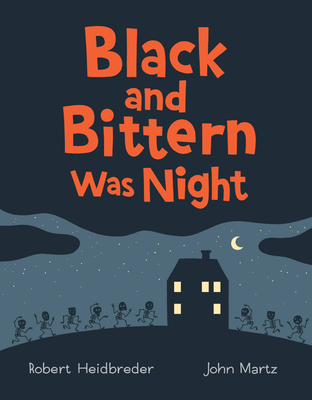 This is sure to be a hands-down favorite as a read-aloud --- for all ages --- during the Halloween season or anytime fun wordplay is called for. It makes a fabulous language arts introduction to rhyming poetry that will surely inspire children to create their own made-up words and stories. Separately, it can also work for social studies discussions about cultural celebrations such as Halloween that focus on images and tales of the dead. Robert Heidbreder is an award-winning children's poet and author. His many books include I Wished for a Unicorn, Eenie Meenie Manitoba and Drumheller Dinosaur Dance. Robert spent thirty years as a primary school teacher and, in 2002, won the Prime Minister's Award for Teaching Excellence. He lives in Vancouver, British Columbia. John Martz is an illustrator, cartoonist and graphic designer. He won a 2011 Joe Shuster Award and has twice been nominated for a Doug Wright Award. John is also cofounder of the illustration blog ?Drawn!?. John lives in Toronto, Ontario.